(1) A converging lens is made of 5 layers of transparent material (fig.). 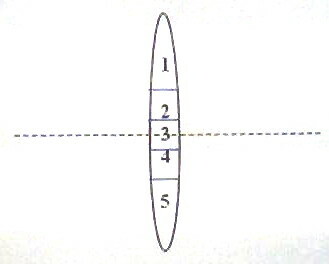 Layers 1, 3 and 5 are of refractive index n1 where as layers 2 and 4 are of refractive index n2. A beam of monochromatic light from a distant object, proceeding parallel to the principal axis, is incident on this lens. How many images will be formed? Since the lens is made of layers of two different materials, n has two values (n1 and n2) and so the focal length f has two values. Therefore there will be two images [Option (b)]. 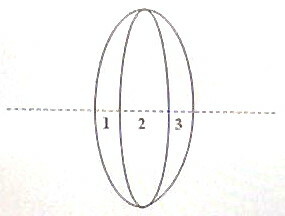 (2) A converging lens is made of 3 portions (1, 2 and 3 in fig.) of three different transparent materials of refractive indices n1, n2 and n3 respectively. A beam of monochromatic light from a distant object, proceeding parallel to the principal axis, is incident on this lens. How many images will be formed? This lens can be imagined to be made of three different lenses in contact. The combination can have a single focal length and hence there will be just one image [Option (a)]. where c is the speed in free space and n is the refractive index of glass. t = 3×10–3/ 2×108 = 1.5×10–11 s.
(4) A point source of light (S) is arranged at a depth d in a large water tank. If the critical angle of water is C, what is the area of the water surface that transmits the light from the source? 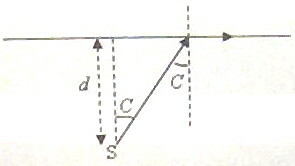 All the light rays within a cone of semi vertical angle C will be transmitted (fig.). 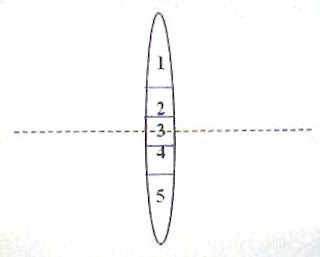 The area of the water surface that transmits the light from the source is the area of the circle of radius r given by r = d tanC, as shown in the figure. [Note that the rays incident at the water surface at an angle C will graze the surface where as the rays incident at at an angle greater than C will be totally reflected back into the water]. (e) In free space the speed of light is a constant irrespective of the wave length of light. v = c/n where c is the speed of light in free space and n is the refractive index of the medium. Different media have different refractive indices for light of a given colour (as determined by the frequency) and for any given medium, the refractive index is maximum for violet light and minimum for red light. There is nothing special about the yellow light and as with light of any other colour, the speed will be different in different material media. Therefore, the only incorrect statement in the above question is (d).